Tips, ideas, and resources from a Certified Professional Resume Writer (CPRW) with more than 13 years of experience writing interview-winning resumes and cover letters. Internet scams are everywhere. A while ago, I received a classic e-mail scam ... it was an e-mail purporting to be from an esteemed colleague of mine. It said he was stuck in London and needed me to wire him some money. Fortunately, I'd heard of this scam before and didn't fall for it. But how many jobseekers are being targeted by employment scams or work-at-home schemes? The answer is: Too many. With the e-mail I received, it's a good time to remind you of these. "Pay to Play" work-at-home schemes. The premise sounds great: Work from home and earn hundreds or thousands of dollars per week. The scam might be sending off for a special "kit" that outlines how to make money (but is often a "system" where the buyer recruits other unsuspecting buyers to purchase the "system). Or you might pay for supplies for a product that is assembled at home and sold back to the company, but only if it meets "specifications" -- which the assembled products rarely do. Other "pay to play" schemes require you to pay a subscription fee to access a website where work-at-home job opportunities may be posted. While some of these sites are legitimate, many are not. The Mystery Shopper. An investigative news program recently spotlighted job postings on Craiglist for mystery shopping positions. The "company" sends the job seekers a check to cover "expenses" and asks him or her to "mystery shop" -- sending money via wire transfer. The individual deposits the supposedly legitimate check into his or her bank account and wires a portion of the amount back to the company, "keeping" the balance as their "salary." A few days later, the "mystery shopper" is notified by their bank that the check they deposited was fraudulent or has bounced. They are then liable for covering the full amount they wired (that money is long gone), plus bank fees. New twist on the Mystery Shopper is the "Reshipper." These job seekers respond to ads for "quality control" positions. You receive merchandise, inspect it, and mail it on to the final recipient. Only many of the goods are stolen (or purchased using stolen credit cards) and you're helping facilitate the crime. Help Accessing the "Hidden Job Market." While there are legitimate job agents (and recruiters and resume writers) that can help job seekers find unadvertised positions, there is also an entire class of scam artists that prey on the insecurities of the unemployed, especially managers and executives. Some firms represent themselves as employment agencies or recruiters but require job seekers to pay $5,000 to $12,000 (on average) for assistance in accessing the "hidden job market." These firms give legitimate career services professionals a bad name. The big giveaway is that they make candidates "qualify" to become a client, require them to provide detailed financial information as part of the applications process, and the spouse is often "invited" to become part of the process. These companies often attract candidates by placing ads disguised as job postings. See the "Ask the Headhunter" article for more details on this. Commission-Only Jobs. I often advise clients to set up a separate e-mail account for job searching, particularly if they have sales-related keywords in their resumes. These folks are likely to be targeted for fake "job openings" for commission-only sales positions. Remind your clients to research companies before going on interviews -- a simple Google search can sometimes alert them to these kinds of "jobs." Do you know of any other employment scams? Comment on my blog below. Are You Getting Interviews, But Not Job Offers? Disclaimer: I am an affiliate of Allison & Taylor and I may be compensated if you decide to have your references checked. However, I never recommend a product or service that I don't personally believe in. When you're in the midst of a stressful job search or career change, it can be difficult to be grateful for the experience -- or to recognize the good things in your life. Good leaders must lead by example. Through their actions, which are aligned with what they say, they become a person others want to follow. When leaders say one thing but do another, they erode trust, a critical element of productive leadership. Here are 10 of the dozens of ways to lead by example. 1. Take responsibility. Blame costs you your credibility, keeps team members on the defensive and ultimately sabotages real growth. 4. Acknowledge failure. It makes it OK for your team to do the same and defines failure as part of the process of becoming extraordinary. I often caution my job-seeking clients to be hyper-aware of how they present themselves to prospective employers. This includes online identity management (be careful what and where you post), making a good first impression (dress appropriately for the interview), and having a great resume. Unfortunately, as this food stylist found out, you can express yourself with tattoos... but it may cause you problems. I was talking to a hiring manager a few weeks ago, and it reminded me of the delicate balance between self-expression and a job seeker's hireability. Particularly among Generation Y, self-expression is often done through tattoos and piercings (including tongues, noses, and lips). And while job seekers have the "right" to have tattoos and piercings, employers may not hire them. This article explains some of the issues related to tattoos, in particular, but more from an employer's point of view. What job-seekers need to know, though, is that even if an employer can't overtly object to tattoos and piercings, the first impression made can be enough to keep you from getting the job. So when you're interviewing for a job, consider covering up those tattoos and removing the piercings. Your hireability may depend on it. Once you get past the first impression -- and have the chance to win the prospective employer over with your skills, abilities, attitude, and personality, then you can show off your expression. 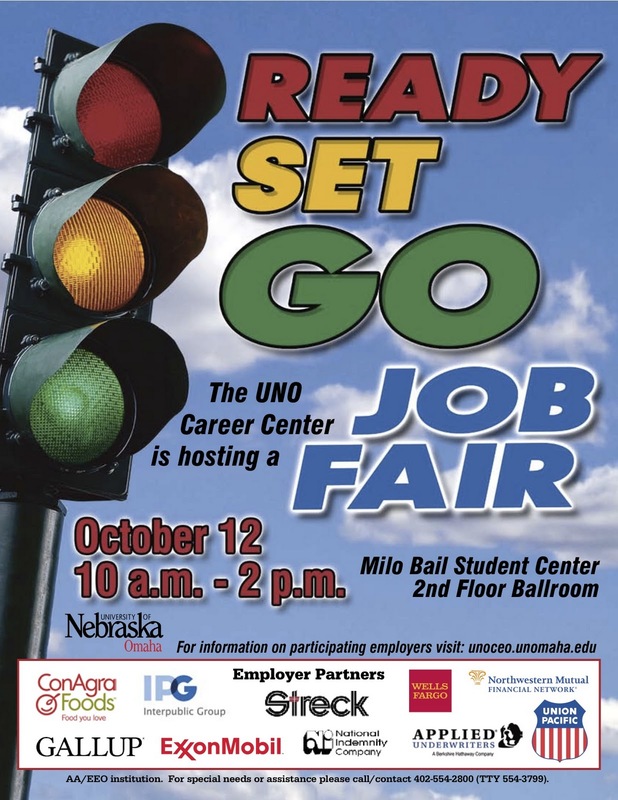 UNO will host a job fair on Oct. 12. More details here. 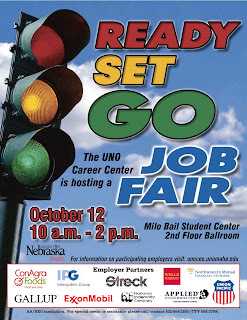 The Fall 2010 Job Fair will take place on October 12. Students and alumni who are genuinely interested in pursuing employment opportunities in the immediate future are encouraged to attend. Professional attire is expected, and students and alumni should bring copies of their current resume.